Attached are the snapshot and my code for clarification, please let me know I am missing something. "Use the new keyword to create an object instance." The issue has been resolved as i was adding the Service Reference but for WSDL we need to add Web Reference. Is there anyone who can help me in reference to upper post in this thread. Exception Message = "The remote name could not be resolved: 'endpoint.easylink.com'"
For the code which is attached(https://apiforums.easylink.com/system/files/CS_JobSubmit_SMS_Single_0.txt) we need to use http://ws.easylink.com/JobSubmit/2009/07?WSDL as web reference. Then this will be resolved. 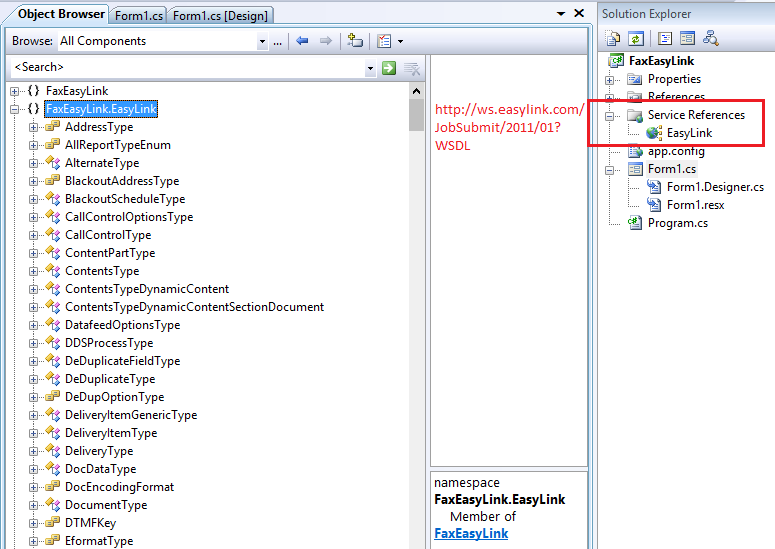 Here http://ws.easylink.com/JobSubmit/2011/01?WSDL is used and code is pointing to 200907wsdl. so that exception is thrown. 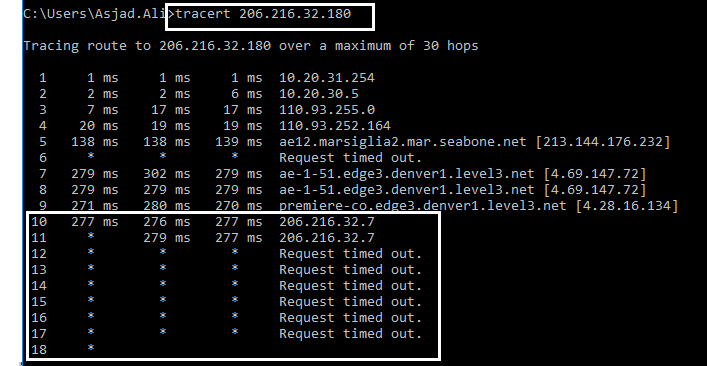 Exception Message: "Unable to connect to the remote server"
Inner Exception: "A connection attempt failed because the connected party did not properly respond after a period of time, or established connection failed because connected host has failed to respond 206.216.32.180:80"
Note: I have commented the method for Proxy setting in my code, I am assuming that this method is for proxy setting. Please guide me if I am wrong. I don't have idea on this. But please cross check whether server is up and running. Please see the findings from my side and let me know if I am missing something while configuring the API. The request has been reached out to your network but looks like your firewall is blocking it. Let me know if anything else required from my side. If Firewall is blocking please uncomment Set_Server_and_Proxy in the code and check once. I am not able to locate the definition of the function Set_Server_and_Proxy. @Prabhakaran i am also unable to locate the definition of function Set_Server_and_Proxy. Please share the definition of method if you can manage or is there any other way around? We have tried all of the solutions recommend how can we work around this? we have already initiated a mail conversation regarding this issue. @Tammy_Gargiulo Do you have any idea on this? Is there any other URL which we can hit to send fax? URL in WSDL is not reachable . 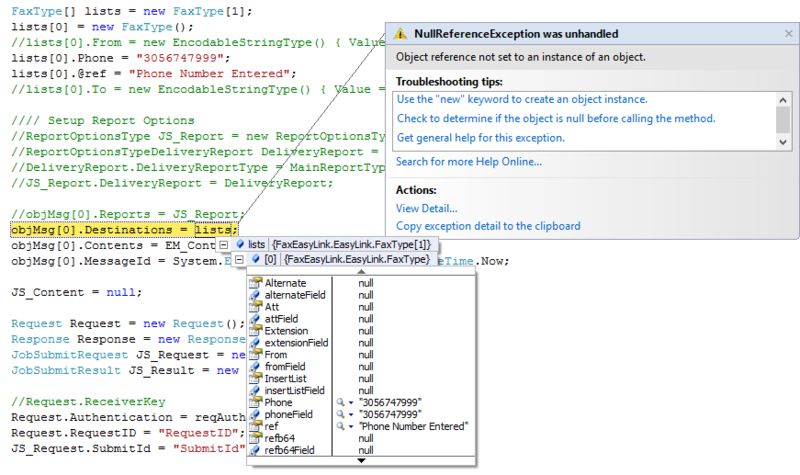 Exception message:"The remote name could not be resolved: 'devxoaapp2.xpedite.com'"
Code is attached kindly review. Hi I have attached the code which is compiled successfully and tested by me. and fax number has to be updated here. EM.Url = "http://devxoaapp2.xpedite.com:8080/syncreplier"; //the EasyLink URL to submit to. If you are outside company vpn you may not have access to the above url. I will check with team and update you on this url. As per the code,These files will be present in the directory where the binary is present. @Prabhakaran thank you for your quick response, I am still getting exception when it tries to connect to URL. Exception Message : "The remote name could not be resolved: 'devxoaapp2.xpedite.com'"
I think you need o give me access to this link. You needs to talk to a sales engineer for creating the test account. A sales engineer will provision the account in test2 and provide the URL for test2. I have no idea where you got the URL from -that does not work. When we used this URL provided by our sales rep we are not getting any errors, however the end user is not receiving any fax. How can we remedy this issue? Make sure that you have a fax number and test account to test and update the information in the below field. faxtype.Phone = "7xxxxxxxx";// fax number has to set here. 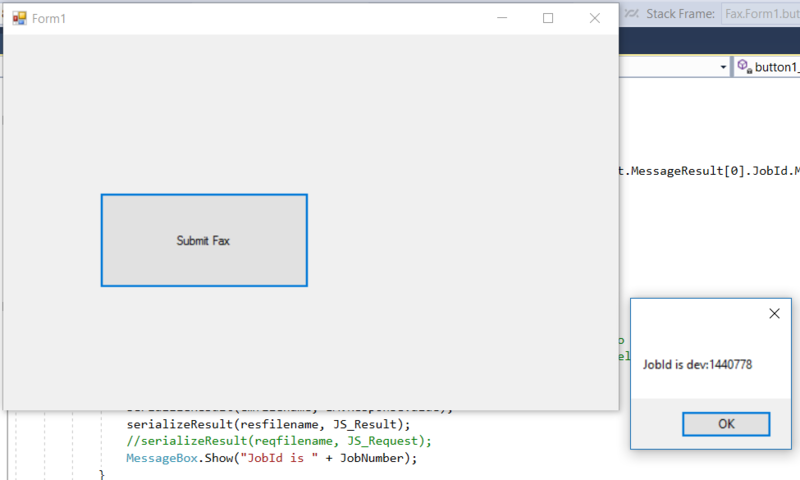 The code sample that i have attached in the previous sample will give the Jobid. If still fax is not received , Give me the Job Id. I will check it.